The new Stralis features all the solutions adopted by the ECOSTRALIS for improving fuel-efficiency.This is a specific package of technologies that delivers TÜV-certified fuel savings of 7.32%. ​ECOSWITCH limits top speed and optimises the performance of the driveline according to the actual load of the vehicle. 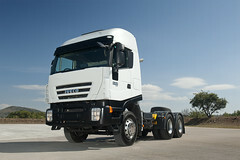 ECOFLEET partially disables manual use of the EUROTRONIC automated gearbox, thus preventing inefficient driver inputs. The TPMS (Tyre Pressure Monitoring System) helps reduce fuel consumption and tyre wear, while enhancing vehicle safety.